If its Sunday, 1230PM, and Im with my big brother (happens most Sundays--almost, not always) you can find us in our 2 guaranteed meet up spots in Chinatown: Excellent Pork Chop House or 69 Bayard/Big Wong. Excellent Pork Chop House is on the off skirts of Chinatown-- not on mainstream Canal-- but by all means very popular. *Best things about this place are that menus are translated to English--they even have a PICTURE menu for you...AND you can stay as long as you want. **Worst thing?? It tastes so frikkin good...but its because they add MSG. (Our mom would strangle us, but hey, its sibling bonding). We get maybe a side dish or two, but the main meal is the pork chop-- all meat, not fat like May Wah. 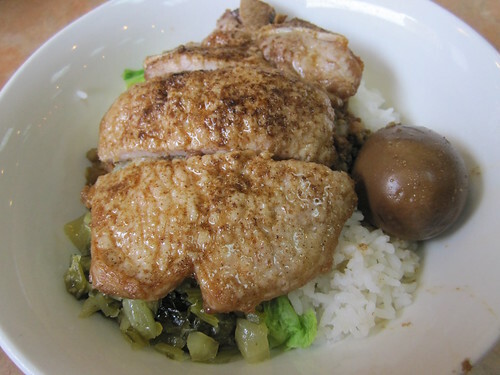 It comes on top of white rice, preserved cabbage, and steamed cabbage. Order an egg (50cents-- gives extra texture), add a little bit of spicy chili oil, and youre guaranteed for a feast! Oh, and porkchop over rice only costs you $5.00...what a steal! 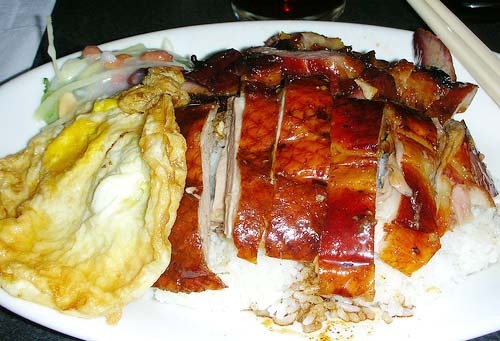 And then when we are in the mood for roast pork or duck omelet its between Big Wong's (brothers preference) and 69 Bayard (my preference). *Big Wong is immensely popular with the Cantonese community and I will grudgingly agree that it may taste better than Bayard's. **But the service is rushed and you feel like youre getting kicked out all the time. We've stayed for over 2 hours talking once, but I dont think they were happy about that. Oh and its on Mott Street-- crowded and touristy. *69 is quiet and ghetto. Guaranteed seats, fast service and hidden on Bayard. (Hi, I have a thing for hidden food) **Tastes almost as good. This pic is of BBQ duck and egg on the side. Gives you a better understanding of the ingredients. But what we always get is the BBQ pork chopped and served as an omelet. Doesnt look as pretty, but damn good. Just say 'cha siu dan fan' and youre set! Both also under $5.00.